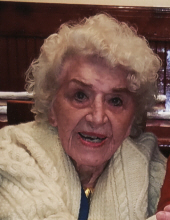 Marie Franciscy passed away on March 19, 2019. She had a zest for life and lived independently for 104 years. She lived in Berwyn Illinois, Ormond Beach Florida, and Toledo Ohio. She was a church organist, librarian, teacher, and school administrator. Everywhere she went, she delighted in studying the people around her, looking for something about them that was fun, important or beautiful and then celebrating that with them. It was a beautiful gift. She will be greatly missed by her dear friend, Dorothy Hakim and grandchildren, Sandy, Rob, Kerry and Bill Jr. Her son, William Barry (Nancy) will also miss her. She was preceded in death by her husband, William, and long-term partners, Dan Warner and Earl Dryden. The family wishes to thank Hospice of Northwest Ohio for their excellent care. To plant a tree in memory of Marie Franciscy, please visit our Tribute Store. "Email Address" would like to share the life celebration of Marie Franciscy. Click on the "link" to go to share a favorite memory or leave a condolence message for the family.